Bad Stream, No Consciousness: Beast is coming back! Iron Maiden are returning to Bangalore for a gig - this is their second time in the city after 17th March 2007. After my experience at that concert, and also after I missed the Mar 2008 concert in Mumbai, I cannot rest until I get my hands on the tickets! Unlike last time, tickets are available only through the DNA networks site. Its both good and bad. Also, not that I'm not willing to spend an exorbitant amount (1600 INR) of money for the concert ticket, I'm still waiting to see if any of my sources can get to an inside man(/woman) and land me a free ticket like last time! :D But this waiting game is going to be short, for I cannot risk even the slightest possibility of wasting too much time and tickets being sold out by then. But from past experiences I've seen that DNA usually sells more tickets than the actual capacity of the venue - like, take for example the 2007 gig. The officially advertised head count at the concert was 12000. But, there were reports of close to 16000 people being there on that day! So, this should also allow me a (small) extra buffer period. Of all the bands I follow - this one's different man - I mean, which other band on the face of this earth, is so loyal to the fans that they spend almost 4 months of a year touring around the world?! Which other band has a custom built Boeing 757-200 aircraft to fly the band, the entire stage crew and all the cargo to all their gigs?! 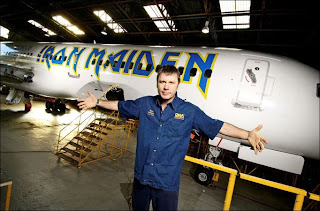 Which other band has their frontman actually flying that aircraft?! And which other band, actually fly fans to the concert venue on their own aircraft?! I cannot decide what is cooler among all of the above stuff about them! Nothing would beat this - making great music for the last 25 years and still being so down to earth! Well, I think I should start building up stamina for some non-stop screaming on the concert day! If you're a maidenhead reading this, see you at the gig mate!